"The original mission was to write a full-on thrash metal record and the result was the complete opposite"
Assembling any super group always presents myriad challenges. Doing so with 25 members from successful bands from around the world seems virtually impossible, and maybe in any other genre it would be. But metal is unique. It’s a genre that somehow unites a very diverse fan base. People may dig or create in different subgenres, but all are metal fans and share a common bond, an allegiance to the music. Mark Menghi is the mastermind behind the METAL ALLEGIANCE concept. He set out to write and record with a group of metal’s elite and the outcome is an eponymous debut record of critical acclaim released September 18, 2015. Shortly thereafter, METAL ALLEGIANCE did a West Coast tour in support of the new record and is now set to do what the group is calling its "Destination (Almost) East Coast" tour with 7 dates beginning March 31st. 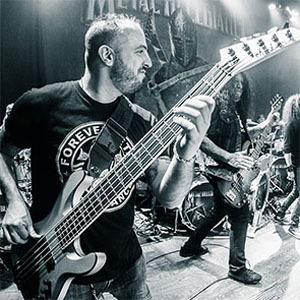 I had some time to chat with Mark Menghi about all things METAL ALLEGIANCE, its beginnings, recording the album and the upcoming tour. It comes as no surprise that this has been and continues to be a monumental project, but definitely sounds like one wherein everyone involved is really having a blast, too. KNAC.COM: How did the METAL ALLEGIANCE concept originate? MENGHI: It started around 2010 or 2011 under a different name. I was working for another company when I came up with the idea. I ended up parting ways with them and that’s when I founded METAL ALLEGIANCE. We eventually did a show on a boat, which went really well. Mike (Portnoy), Alex (Skolnick), Dave (Ellefson) and I were hanging out on MOTORHEAD's Motörboat cruise and decided we should write a record, too. It’s been really crazy ever since. KNAC.COM: Once you had the idea in mind, how did you determine who would make up the core lineup? MENGHI: I’ve known Mike and Dave for a while and the three of us have been friends for quite some time. I knew of Alex, but we didn’t know each other until we met on the boat. Instantaneously, Alex and I hit it off and he and I have become the two tightest of the group. We both live in New York, so it’s easy for us to get together, whereas Mike lives in Pennsylvania and Dave in Arizona. The core lineup just kind of happened as a result of our friendships. The original plan was to get as many people together as possible to write a record. But we soon realized that putting 25 chefs in the kitchen creates a lot of opportunity for things to go wrong. Over time and as we were writing, the four of us hit it off creatively, as well, so we decided to do the bulk of the writing ourselves. We had about six or seven tunes written within just a few days and banged out a few more when we got back together again. Before long, the record was finished. We didn’t need to go down the road of bringing in a bunch of different writers. The core lineup happened very organically just like everything else on this project. It’s all been smooth and natural. None of it ever felt forced or manufactured, which is great. KNAC.COM: How receptive were the core members and those making special appearances on the record to taking time away from their existing projects to participate in METAL ALLEGIANCE? MENGHI: Oh yeah! Everyone was stoked about it. When we spoke with Randy (Blythe), Andreas (Kisser) and even Gary (Holt), they were all like, ‘Yeah, we’re in!’ The bulk of the record was recorded on Long Island, which is where I live, at a place called Sabella Studios. When SLAYER hit town, Gary would take a day to track with us and Randy flew up specifically for this project. The four core members wrote 90% of the music. Even with “Dying Song” we had the music written and I had lyrics ready to go. But Philip (Anselmo) has been part of this project since the beginning, so we gave him a clean slate and told him to have at it. What he brought back is pretty damn amazing. Personally, I’ve known Philip for a long time and I haven’t heard him do clean vocals like that in I can’t even tell you how long. It was a breath of fresh air. It was the same with Randy. I co-wrote the lyrics to “Gift Of Pain” with Randy. I gave him the name of the song and the choruses. [Laughing] Then I sang it in my best ‘Randy’ voice to him and he took that and ran with it. KNAC.COM: The album features tracks that range from slow, sludgy hard rock to thrash metal to progressive. Was it always the intent to demonstrate the diversity of the genre with this concept or did it evolve as a result of the disparate styles and influences of the band’s membership? MENGHI: The original mission was to write a full-on thrash metal record and the result was the complete opposite. We just got in a room and wrote. We never set out to write a song for a particular person or in a certain style. We wrote all of the music before we had any of the singers in mind. As we were writing, like with “Gift Of Pain”, we knew Randy would kill on that song, and “Can’t Kill The Devil” had Chuck (Billy) written all over it. We didn’t decided to write one style of music and that was it. We just wrote to write. “Let Darkness Fall” is a great example. That song goes all over the damn map creatively. KNAC.COM: You’re headed out on a quick, 8 day run from the 31st of March through the 7th of April for the "Destination (Almost) East Coast" tour, but are hoping to add additional U.S. dates at a later time. Is putting a tour together with this super group again mostly a logistical issue resulting from its members’ prior tour and recording session schedules? MENGHI: It’s a giant logistical issue, so we do it when we can. That’s basically what it comes down to. We did a four-date, West Coast run in January, which was awesome. We hit L.A., Frisco (San Francisco), Vegas and the San Diego area, and when we were done, we didn’t want it to end. We’d booked smaller rooms because we loved the club-type atmosphere and being with the fans. We decided to book another run like that only this time on the East Coast, which is why we’re calling it the "Destination (Almost) East Coast" tour. We’re doing the same thing out here but for the Machine Shop show in Flint Michigan on April 2nd. Everyone is really looking forward to it. KNAC.COM: Aside from David Ellefson, who’s out with MEGADETH right now, you’ve added Chuck Billy, Ron “Bumblefoot” Thal, and Mark Osegueda to the tour lineup. Is it the goal that these three will stay on as new dates are added or are they special guests for this leg of the tour only? MENGHI: Dave’s not joining us on this tour because of MEGADETH commitments, but that’s his priority. Mark (Osegueda) has been with us for every (METAL) ALLEGIANCE gig. Even though ALLEGIANCE is my baby, he’s done more of its shows than I have, he and Alex. Those two are definitely part of the core. Chuck is, too. Chuck didn’t do the West Coast run with us, but he’s been there for just about all of the rest. We like to include the musicians we’re comfortable with, however; in the case of “Bumblefoot” (Ron Thal), he’s never jammed with us before. He did a solo on “Triangulum”, so we decided to see if he was available for this tour. He was and loved the idea, but he’s new to the fold. I don’t think anybody knows about it yet, but Chris Jericho will also be joining us for two shows in Pennsylvania and New York. It’s the same thing with him; he’s new to the fold. We keep trying to make it a little bit different every time. KNAC.COM: There are certain tracks that seem easier to recreate live with the members of METAL ALLEGIANCE headed out on March 31st, such as “Can’t Kill The Devil”, “Scars”, “Triangulum: I. Creation, II. Evolution, III. Destruction”, “Pledge Of Allegiance” and even the DIO cover “We Rock”. The remaining songs from the band’s self-titled release feature some fairly unique vocals. Can fans expect to hear these songs performed, as well, or are there some surprises in store? MENGHI: We definitely won’t do “Gift Of Pain” live because that has a very particular voice to it (Randy’s). I’m an artist who believes that if it can’t be done live like it’s done on the record then we’re not going to do it. We’ve played “Can’t Kill The Devil”, “Pledge (Of Allegiance)”, “Scars” and “Let Darkness Fall" with Troy (Sanders) live. We’ve done just about every song live. We haven’t nailed down the set list for the upcoming tour just yet. Typically, we figure that out about a day before we head out. We also have a whole arsenal of covers that we do, and we’ll hash that all out a few days before the tour. When people come to our show they’re going to see a bunch of dudes having fun first and foremost. We genuinely enjoy being around each other and jamming together. As well, we like to challenge one another. We’re always pulling stuff people don’t expect. When we do covers, say a (IRON) MAIDEN tune, I guarantee it will be a song that MAIDEN never plays live. Or we’ll pull out an original that no one expects. So, fans should expect the unexpected when they come to a METAL ALLEGIANCE show and expect to have a great time, too. KNAC.COM: Clearly, touring this record and getting the music in front of live audiences is a top priority for the band, but what else is on the horizon? Is new material already in the works or perhaps some left over from the first album that’s being readied for a second release? MENGHI: Oh yeah! Mike, Alex and I were in the studio in January tracking a bunch of things that will come to fruition pretty soon. Actually, that’s why I’m in the city (New York) right now, to meet with Dave Ellefson and Nuclear Blast to talk about what we’re going to do next. We have a ton of ideas. It’s just a matter of trying to make some kind of logical sense of it. There’s a lot of music on the table right now, so there’s definitely going to be another record and then some. At this point we’re just writing. We don’t think about who might make guest appearances on future releases. Whatever the music calls for is what we’ll lean toward. We’re not writing with the goal of bringing particular people back, but if the music calls for it, then absolutely. Right now, it’s a matter of getting together, sharing ideas and seeing what sticks. One thing that’s interesting about ALLEGIANCE is that we never fight. The only thing we might disagree about is our live set list, choosing one version of a song over another. For example, if we cover “God Of Thunder” by KISS, we may go back and forth over whether it should be the Alive II or studio version. Arguing over things like that make it fun, though. It’s because we’re all such big fans ourselves that we want to make the project and our shows as diverse as possible. That’s also why we so greatly appreciate everyone’s support. Hopefully, as time allows, we’ll be able to reach quite a few more markets, as well. 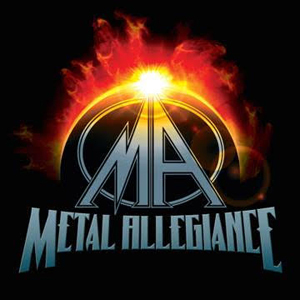 The METAL ALLEGIANCE artists heading out on the "Destination (Almost) East Coast" tour are Mark Osegueda of DEATH ANGEL (vocals), Chuck Billy of TESTAMENT (vocals), Chris Jericho of FOZZY (vocals), Alex Skolnick of TESTAMENT (guitar), Ron “Bumblefoot” Thal of GUNS N’ ROSES (guitar), Mark Menghi of METAL ALLEGIANCE (bass), and Mike Portnoy of THE WINERY DOGS (drums). Given this talented lineup and the great material this super group is bringing to the stage, it should be an outstanding show. Check the dates for the upcoming tour and keep an eye out for future METAL ALLEGIANCE tours and releases as they are announced.